For this month's "Maps Of The Month" featurette, I wish to draw your attention to Richard V. Grant's Heart Of China (PC) maps. Jake "Lucky" Masters is a former World War I fighter pilot, hired by the wealthy E.A. Lomax to rescue his daughter, a nurse who has been kidnapped by a Chinese warlord. As the time ticks away, Lucky's reward money also decreases. Will Lucky be able to penetrate the fortress in Chengdu to rescue Kate in time? The 1990s PC game landscape included a number of popular point-and-click adventure games. (Gotta love that VGA!) Besides Sierra's own "Quest" titles, there were other games, including a few by Dynamix (though they were owned by Sierra in the '90s). After the successes of Rise Of The Dragon and The Adventures Of Willy Beamish, Dynamix released Heart Of China, a 1930s globe-trotting adventure that takes place from Hong Kong to Paris, with action, romance, intrigue, pointing and clicking, and even arcade sequences! For about the past couple years, Richard V. Grant has been mapping a number of games for VGMaps.com, many of them computer adventure games. It is no surprise that he would get around to Heart Of China. These maps show an interesting yet natural approach to the point-and-click genre - laying out the game's story sequences as a series of flow charts. This is especially handy because this game is narrative-heavy and with multiple endings. Richard V. Grant shows a degree of thoroughness in the games he maps, and Heart Of China is certainly an example of that. 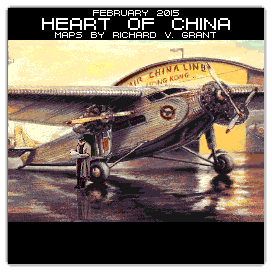 So to recognize the effort and love in the mapping of adventure games, Richard V. Grant's Heart Of China (PC) maps will be known as VGMaps.com's Maps Of The Month for February 2015.